We’re a hot mess, and you’re going to want to come work here… said no company career website ever. Right? 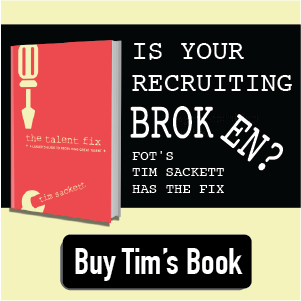 But when it comes to your recruiting efforts, what if you were to be just a little bit more honest about the flaws—and truly embraced them? And I’m not talking in an interview setting, copping up to the “challenges” of working there. I’m talking about being more up front, even from an employer brand perspective, with what’s “ugly” about your organization. And the same goes for how we think about our organizations as employers. Call it denial, call it spin—we’re all guilty of focusing on “other characteristics” as they say. So, what if we were all just a bit more… honest? You aren’t the sum of whatever your ugly thing is. That’s just one piece of your organization’s story. And imagine if with job seekers we could authentically say… this is who we are. The great, the good, and yes, there’s a little bit of ugly. You, Mr. Candidate, bring your whole self to work, so we’re gonna present to you everything we are, too. After all, if this is gonna be a successful relationship, we both need to know what we’re getting ourselves into. And by the way, your call to action could be to have them help come fix the ugly… or ask them to just live with it for a few years while they gain some really awesome experience in the meantime. Which is totally what I think Amazon should be doing. Ugly is okay. And it’s okay to talk about the ugly as part of your employer brand. Embrace the ugly. Author’s Note: If you are a long-time reader of Fistful of Talent, perhaps you may remember that back in the day I held position number two here on the blog. Former writer then editor, I had a lot of fun waxing poetically about all things talent. And now, I have come to reclaim my seat. That’s right—I’m back, snitches!! I have missed you, and maybe you missed me. A little, right? Come on, give me at least that. 🙂 Anyway, thanks for continuing to read the blog. I owe a lot to FOT, and I’m happy to have a voice again in this space.